Since I haven’t done the 30, or 60 in this case, unit kusudama these were assembled without glue. Just a bit challenging assembly for the 12 unit kusudama. However as long as you don’t use very big units it’s perfectly assembled without glue. 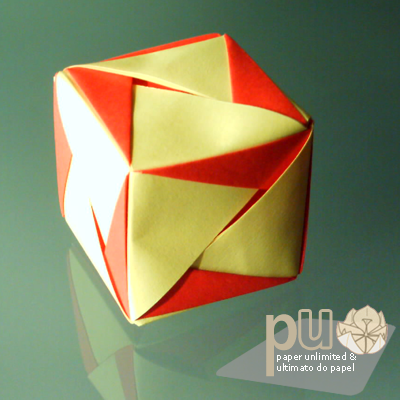 These were made by 6x12cm /2.4×4.7″ coloured paper, the normal colour paper of 80 grams per square meter. The 30 units kusudama will be a little big with these paper sizes but by using 80g/m2 paper any smaller size will be very hard to assemble. 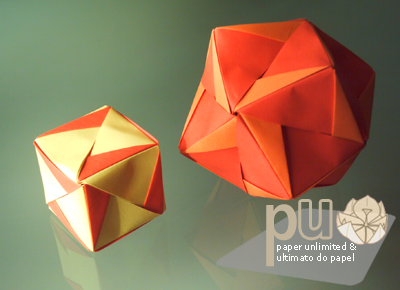 This entry was posted on 2008|02|11 at 12:02 and is filed under kusudama, modular origami. You can follow any responses to this entry through the RSS 2.0 feed. You can leave a response, or trackback from your own site. However your english, even with some flaws, is perfectly understandable!